Rainbow Au Pairs is here to offer peace of mind, convenience and a commitment to ensuring that families are provided with the Au Pair they want. They recognise that the key to a good Au Pair experience is matching the needs of the family with the attributes of the Au Pair. An Au Pair, who has been welcomed and settled into a safe environment, and has been properly matched to the requirements of the host family has every prospect of being a happy and valued addition to the family. 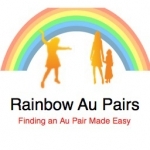 Rainbow Au Pairs provides a fresh approach to finding and placing au pairs. They have a dual commitment to both host families and au pairs to ensure both parties are happy. They offer genuinely tailored matching services, based on the principle of taking time to understand people’s personal requirements, skills and motivations. Our unique services include comprehensive profiling match for each placement. Not only do they provide a choice of Au Pairs to match your needs, they take away the hassle of finding, interviewing, vetting and effectively promoting the reason why an Au Pair should consider your family. It is a very time consuming and personal service they provide. For most customers, their modest fees are considered very fair, balanced against the time and effort they put in to finding the best Au Pair they can.